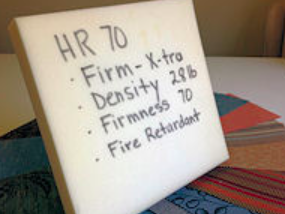 Has 20+ years experience in the upholstery profession as an owner and operator. She has redesigned furniture and also worked with various companies in the design and construction of new products. She received an Upholstery Degree from Century College. 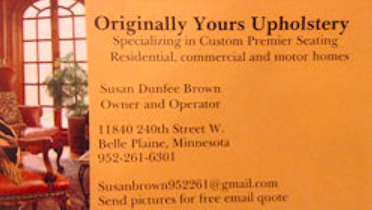 Susan is also a graduate of Mankato State where she studied Business Communication. "I enjoy the overall sensation of working with old and new. I appreciate the variety of scents whether pleasant or pungent, visual pleasure in designing, touching the wide range of textiles, hearing the rhythm of the tack hammer and ultimately-the taste of satisfaction knowing I have played a role in delighting my customer." Currently, Ben works another job but is available as a second pair of hands. He enjoys the "nuts and bolts"of the industry. He also enjoys the pick up and deliveries because he gets the opportunity to meet our customers. Susan is interested in educating the public about the benefits of repurposing furniture. She also promotes the recycling of discarded foam which protects our environment. Susan and Ben are strong advocates of promoting local tradesmen no matter what capacity. Active members of Professional Upholsters' Association of Minnesota. Active member of Business Networking International.